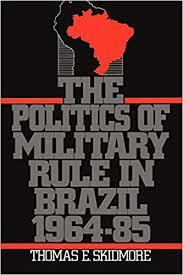 Brazil Military Dictatorship research papers discuss the nation in South America and how it was ruled by military dictatorship from 1964 to 1985. Today, Brazil is one of the strongest emerging economies on the planet. Yet the largest nation in South America was ruled by military dictatorship from 1964 to 1985. Learn more in a research paper from Paper Masters. It began in April 1964 with a coup d’état following political crisis, and did not end for another two decades, ending with the elevation of Jose Sarney to the office of President. Brazil’s Second Republic fell in 1964, when a cabal of military leaders could not find an acceptable replacement for President Joao Goulart. Right-wing hardliners installed Army Chief of Staff Branco, followed by the administration of other military leaders throughout the 1960s and 1970s. In the first months after the coup, resistance in the form of student protests shook Brazil. Thousands were detained. The military dictatorship of Brazil was infamous for its torture of prisoners and dissidents. A succession of kidnappings of foreign diplomats by dissidents, including the U.S. Ambassador, embarrassed the Brazilian regime, and led to its waning influence on the world stage. Beginning in 1979, with the passage of the Amnesty Law, Brazil began moving back towards democracy. This process was completed in 1985, with the election of Sarney. However, the law also meant that no one would be prosecuted for the numerous human rights violations that took place during the period of Brazil’s military dictatorship. Since its inception and until the revolution of 1889, the Brazil was a monarchy. When first colonized, it was under the Portuguese control and therefore was part of the monarchy. By the time the republic was formed, Brazil had cut ties with the Portuguese monarchy and had become a monarchy itself. The revolution that led to the monarchy peacefully advocating his thrown was supported by the coffee barons who had much of the influence in the country. They were upset because of the emancipation decree in May 1888. The Revolution hurt these barons financially and therefore they turned against the government. Another issue was that the Roman Catholic Church, which held political power because it was the largest religion in the county did not like the emperor’s policies. The final issue was that of the right to vote on local governments was continually being reduced. The revolt was lead by the military. General Manual Deodoro da Fonseca declared Brazil a republic in November of 1889. Like any republic, a constitution was soon drawn up and was adopted in February of 1891. Fonseca was elected the first president by the republicans and Field Marshal Floriano Vieira Peixoto was declared minister of war to ensure the allegiance of the military. The reason why the country was not made into a military dictatorship was because there were many opinions between the military groups and elites. Even though it was not a military dictatorship, there were many military leaders that held positions in the government. This transformation would not be as easy as it was in the United States. Problems began almost immediately. The military became the only national institution of the new country. Fonseca’s policies were not supported by the Congress. Instead of changing policies, Fonseca instead dissolved the Congress and briefly turned the country into a dictatorship. The military was split politically on whom to side with and a month after Fonseca declared a dictatorship, he was forced to step down by military revolt led by the vice president, Floriano Peixoto. Peixoto kept the government as a dictatorship which he ruled over for six years, through another military coup. For about the first decade, the military had complete control over the country. Both Fonseca and Peixoto were military leaders at the time. Being backed by a military was their way of staying in power. At this time, the effects on society were great. The military was supported by the elite in the country. The lower middle class and working poor were not represented. This meant that all the policies that were argued over were usually policies that would benefit the elite. The first civilian president was Jose de Moraes Barros. It was during his term that order was restored. In 1898, another president, Manuel Ferraz de Campos Salles started to work on strengthening the economy of Brazil by securing a foreign loan. During the next decade, Brazil’s economy faced problems because of the prices of their two major products coffee and rubber were not stable. During this time another president took office. President Hermes da Fonseca was a militarist. His term would be known for the political and social problems internally within his administration. This had to do with the power behind him being the military and the military being controlled by the elite whose survival was directly linked to the economy driven by the two products. The military gained control through the Institutional Act that was signed in April of 1965. It suppressed the rights of many people and another law would curb civil liberties. Congress again elected a president in 1966. This military government was also mainly concerned with the economic growth of the nation. “While aiming at modernizing and rationalizing the administration of welfare, the changes introduced by the military government were largely completing the task of political incorporation initiated by Vargas.” In three years, after a stroke suffered by his predecessor, General Emilio Garrastazú Medici was elected president. Medici intensified the repression including censorship and this caused an increase in the number of revolutionary groups. The Roman Catholic Church would eventually denounce Medici because of the neglect of the poor. At the close of the military reign, the country’s economy was much stronger. “From 1940 to 1980 the average yearly economic growth rate was an impressive 7 percent.” This led to the strengthening of the government to the point where the military no longer needed to rule and therefore, the civil institution that is in control today was developed. Their last constitution was signed in 1988 and from then on they have been a democracy. Brazil has a unique history when it comes to the politics, the social connections, and the military. For most of its existence, Brazil has either been a monarchy or in political turmoil. The elite have always been in control of the country though. That is because they have vested interest in what happens and have the financial and political clout to achieve what is in their best interests. Only within the past twenty years has Brazil been able to obtain the democracy for the people through movements dealing with the lower middle class and working class. As seen the military had great control over the country and though there is a lack right now of asserting of that control, with the country’s history, if the conditions are right, the control may revert back to the military some time in the future. One can only hope that the path that the country is on now leads them forward. If a free country truly is a complicated piece of machinery then this country should be free. Diplomacy research papers explain how the relationships that nations have with each other are used to conduct negotiations. Order a research paper on diplomacy from Paper Masters. Realpolitik research papers explain the term used to describe diplomacy that is based on power and practicality, rather than ideologically. Paper Masters writes custom research papers on Brazil Military Dictatorship and discuss the nation in South America and how it was ruled by military dictatorship from 1964 to 1985.